The huge range of Scotch Mounting Products includes heavy duty, super strong and removable mounting solutions. 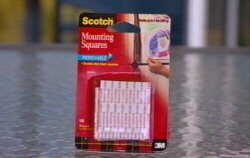 Scotch Mounting Products are so easy to use, you don’t need any tools. Scotch Heavy Duty Products can adhere to painted walls, cabinets, wood, glass and even bathroom surfaces as long as the surface is clean and dry Scotch Heavy Duty Mounting Tape will permanently bond to most surfaces. Just wipe the surface with isopropyl alcohol and follow all the clear instructions to make sure you have the right product for the right job. With that simple preparation Scotch Heavy Duty Range can hold items weighing up to 900 grams and is available in 2 handy widths. Scotch also has two tough tapes for heavy jobs both inside and outside the house the industrial-quality, Heavy Duty Mounting Tapes have a hundred uses around the home and office. The Exterior Tape is weather and mildew resistant and can hold up to 2.3KG. The interior tape is clear and can hold just over 900 grams. Check the weight before you hang. No hammers, no drills, no rusty nails or screws, no messy glue, no worries, thanks to the makers of Scotch® Mounting Products. You’ll find the Scotch® Mounting Range at your nearest quality retailer.